Retired Lt. Gen. Michael Flynn will reportedly decline to testify or hand over any documents subpoenaed by the Senate Intelligence Committee as part of its ongoing probe into Russia’s 2016 election meddling. The panel issued a subpoena for documents detailing Flynn’s communications with Russian officials. The US intelligence community credits agents of the Russian government with hacking the Democratic Party last summer. Sources close to Flynn have told several news outlets that Flynn will not release the documents, asserting his Fifth Amendment right against self-incrimination. In March, Flynn’s attorney, Robert Kelner, announced that Flynn was willing to be interviewed by the FBI and the Senate Intelligence Committee in exchange for immunity. “Gen. Flynn certainly has a story to tell, and he very much wants to tell it, should the circumstances permit,” Kelner said. No one jumped at the deal. But with Flynn now adamantly refusing to cooperate, the topic of immunity has garnered new interest. Witnesses subpoenaed by Congress still retain their Fifth Amendment privilege, much as they would in a courtroom setting. For Flynn to obtain the ability to testify without his words being used against him, at least two-thirds of the Senate Intelligence Committee would need to vote in favor of granting him immunity. That decision is likely to be weighed against the likelihood of Flynn revealing serious criminal conduct, as well as the overall value of the testimony and whether he might implicate other Trump administration or campaign advisors. If immunity is granted, it would be difficult if not impossible for prosecutors to charge Flynn at a later date based on anything he says. Any subsequent criminal proceedings would require prosecutors to demonstrate that the underlying evidence was not derived from Flynn’s testimony. Likewise, any incriminating documents Flynn turns over in response to the subpoena while under immunity would be essentially taken out of play. At least two-thirds of the Senate Intelligence Committee would need to vote in favor of granting him immunity. Flynn, whose tenure as national security advisor was the shortest in history, was reportedly fired for falsely portraying the substance of five December 29 phone calls with Russian Ambassador Sergey Kislyak. Among those Flynn is said to have misled is Vice President Mike Pence, who in televised interviews on Fox News and CBS falsely claimed there had been no contact between the Trump campaign and any Russian officials. Yet, the frequency with which the Trump campaign communicated with the Russians far exceeds merely the handful of phone calls Flynn held with the Russian ambassador. Reuters reported last week that Trump advisors had no fewer than 18 conversations with Russian officials and Kremlin associates during the last seven months of the 2016 presidential race. Flynn was involved in some of those conversations. What’s more, four current US officials told Reuters that, during the transition period, Flynn and Kislyak collaborated to create a secret “back channel” between Trump and Russian President Vladimir Putin so that the pair could talk free from US intelligence eavesdropping. President Trump, who encouraged Russia to hack his campaign rival, Hillary Clinton, during a July 27 press conference in Florida, has repeatedly derided the investigation into ties between his campaign and Russia as a “conspiracy theory,” a “total fabrication,” and “fake news.” After receiving a classified briefing on January 11, however, then-President-elect Trump did acknowledge that it was Russia who hacked the DNC. “As far as hacking, I think it was Russia,” he said. News of the Trump campaign’s “back channel” discussion with Russia arrived the day after the New York Times revealed that Flynn informed the Trump transition team (led by Pence) on January 4 that he was under investigation for secretly working as a paid lobbyist on issues relevant to the Turkish government. The White House has acknowledged that Flynn notified the transition team that he might need to register as a foreign agent, but claimed that Trump was not personally notified. Due to the receipt of payments from foreign entities, as well as allegations that he did not properly seek permission from the Pentagon to lobby on the behalf of a foreign country, Flynn has been accused of violating military regulations founded in the US Constitution that prohibit retired military officers from accepting “emoluments” from foreign powers. Flynn has proven radioactive to the White House, which has in turn sought to diminish his prior role in the Trump campaign. Former CIA Director James Woolsey, who quit the Trump transition effort on January 5, told the Wall Street Journal that in March that he was present for a meeting between Flynn and top Turkish government officials—including Erdogan’s son-in-law—during which the possibility of kidnapping Gulen was discussed. The idea was to covertly “whisk” Gulen away from his home in Pennsylvania “in the dead of night,” Woolsey said. 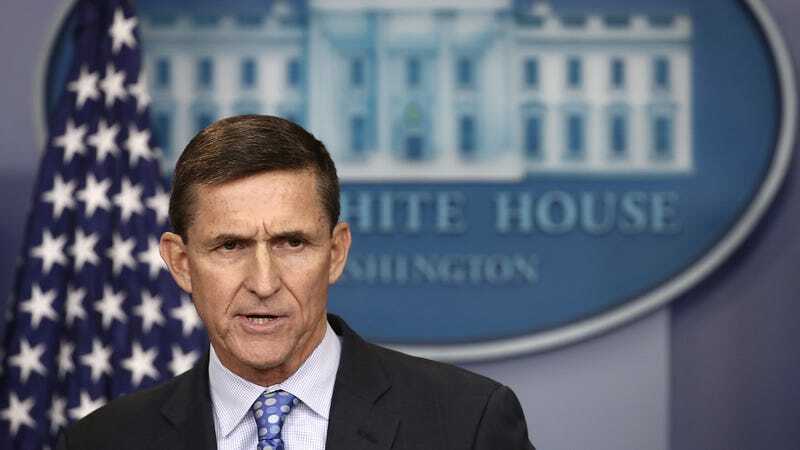 It was further revealed late last week that Flynn had advised the Obama administration to hold off on plans to retake Raqqa—the Islamic State’s de facto capital in Syria—ten days before the inauguration. The Obama White House had decided to involve the Trump transition team in discussions about the plan, which had been months in the making, because it would inevitably be carried out after President Obama left office. Flynn’s request to suspend plans for the attack closely aligned with the interests of the Turkish government—Turkey does not want the US arming Syrian Kurds, which was an integral part of the plan—and no one was aware at the time that Flynn had been paid hundreds of thousands of dollars to represent Turkey’s interests. In July 2015, Flynn also received $11,250 from airline Volga-Dnepr, which is owned by a Russian businessman; another $11,250 from the US subsidiary Kaspersky Lab, a Russian cybersecurity firm; and $45,000 from Russia Today (RT), the Kremlin-backed news network for a Moscow trip during which he attended a gala and sat near Putin. Less than two weeks ago, federal prosecutors reportedly issued grand jury subpoenas to some of Flynn’s associates seeking access to business records. A copy of one subpoena obtained by the Times requests “records, research, contracts, bank records, communicates,” and other documents related to the Flynn Intel Group. The case is currently being investigated by longtime espionage lawyer Brandon Van Grack in the Northern District of Virginia. The Times further reported on May 16 that a memo written by former FBI Director James Comey, whom Trump fired this month, indicates that President Trump may have attempted to pressure Comey into dropping the FBI’s investigation into Flynn. Comey has reportedly agreed to testify publicly before the Senate Intelligence Committee sometime after memorial day about his role in the Russia investigation.